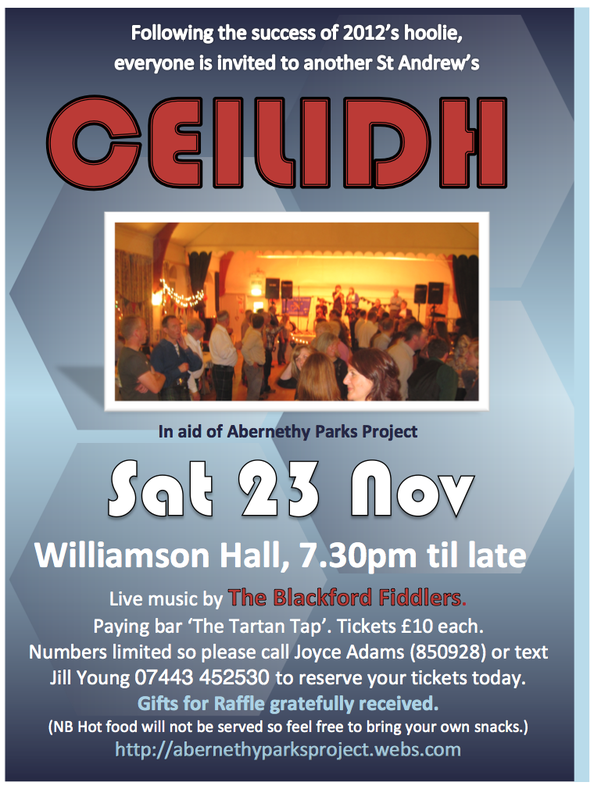 Apologies everyone, the committee have postponed the ceilidh until 2014...it's a busy old time! We're well on our way to covering the costs of phase 2 improvements to Powrie Park - but we still need to raise funds for maintenance and upkeep. So what better way to do it than by having fun! Join us for a hoolie to remember on Sat 23rd November, from 7.30pm at Williamson Hall, Abernethy. There'll be a paying bar, 'The Tartan Tap', live music by 'The Blackford Fiddlers' and a raffle or bottle stall of sorts. Number are limited so please reserve your tickets today. And check out the photos of last year's hoolie!